As something of a traveling player who has produced both positive and negative news at many of his stops, LeGarrette Blount rookie cards are not likely to see any explosion in value, but he has the ability to change the game when given the chance. This makes him (and his cards) worth keeping an eye on. The undrafted back originally signed with the Tennessee Titans in 2010 but was waived, ending up with Tampa Bay. After a strong start to his career with the Buccaneers, he was traded to the New England Patriots where he had a solid 2013 season. He left the next year for Pittsburgh but returned to the Patriots before the 2014 season ended. Over the next few seasons, Blount helped New England win Super Bowl XLIX and Super Bowl LI. He also led the NFL in rushing touchdowns during 2016. Nevertheless, 2017 saw Blount leave for the Philadelphia Eagles, to ultimately play in Super Bowl LII against the Patriots. Shop for LeGarrette Blount cards on eBay. 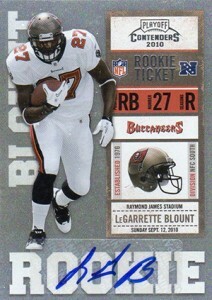 LeGarrette Blount rookie cards can be found in a handful of 2010 products. However, because he initially went under the radar, he was left out of several sets. 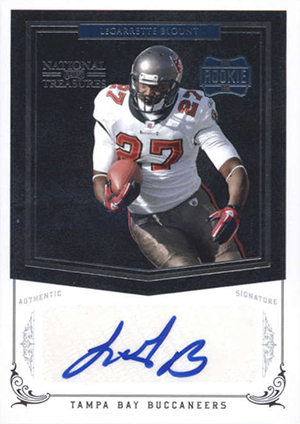 Topps included the running back in just one of their products—2010 Topps Tribute. As a result, collectors have just three autographed LeGarrette Blount rookie cards to chase. And while they're not official NFL cards, Upper Deck included him in several of their 2010 NCAA products. It is important to note that Blount does come with history, though. He was suspended multiple times in college including a major one for punching a Boise State player after a game and getting into it with some fans. He also had some trouble in the NFL due to a preseason arrest alongside Le'Veon Bell in 2015. Usually, the National Treasures rookie cards that draw the most attention come with both an autograph and a massive patch swatch. For Blount, it's just an autograph—and a sticker at that. 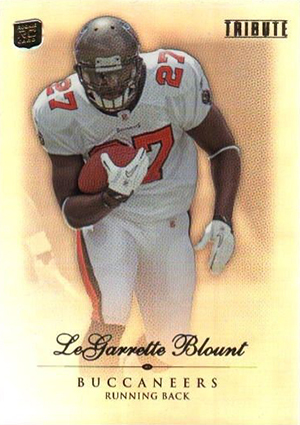 As a lower-tier rookie subject at the time, Blount has no rookie cards with jersey swatches. Although not numbered, this card has a stated print run of 287 copies. The Contenders name and the Rookie Ticket Autographs carry a lot of clout, appealing to set builders. While the foil design and sticker combination isn't the most aesthetically pleasing, collectors will have to take what they can get as there are so few high-end options. As an NCAA card, this isn't a traditional rookie card. However, Upper Deck has done a lot in giving college cards much more mainstream appeal. 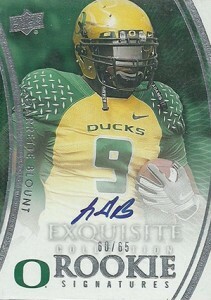 Numbered to just 65 and signed on-card, the 2010 Exquisite LeGarrette Blount has much to offer. It doesn't hurt that the close-up shot and design are very strong, as well. 2017 Score Color Rush Legarrette Blount Hand Signed Auto Nice Card! LEGARRETTE BLOUNT 2010 PRESTIGE ROOKIE AUTO AUTOGRAPH RC CARD #473 999!